Next week, Earth's annual October encounter with the Draconid meteor shower will peak as our planet passes through several trails of tiny rocks and dust from the comet 21P/Giacobini–Zinner. But the shooting star display is also posing some concern for NASA spacecraft. NASA is looking into strategies to safeguard spacecraft, including the International Space Station and the Hubble Space Telescope, from possible dings from the meteor shower. Meanwhile, scientists in the United States and Germany have been experimenting with hypervelocity impacts in order to simulate what kind of damage could occur from meteoroid strikes. Some forecasters say it could be a strong shower, maybe even a meteor storm of up to 1,000 shooting stars an hour at its peak. It is known that spacecraft are routinely peppered by meteoroids and orbital debris. Impacts that result in mechanical damage have been well-characterized. But the electrical effects of hypervelocity impacts are still relatively vague. A leading expert in this research is Sigrid Close, an assistant professor of aeronautics and astronautics at Stanford University in California. For Close and her research colleagues, the question is whether a hypervelocity particle — either a piece of space debris or a meteoroid — that hits a spacecraft but is too small to penetrate, can still cause an anomaly or failure through electrical means. Working with the Max Planck Institute in Heidelberg, Germany, the researchers recently shot small particles at various types of spacecraft material placed inside a vacuum chamber. Plasma sensors, optical sensors and radio frequency sensors were installed within the Institute’s equipment to measure the upshot. The experiment was designed to look for that electrical anomaly. "We think we've found it," Close told SPACE.com. Charge and plasma production, as well as radio frequency, were confirmed from the particle impacts, she added. Close said that the radio frequency appears to be very strongly dependent on speed and therefore most relevant to meteoroids, which travel almost an order of magnitude faster than space debris. "We’re currently writing a journal paper describing these results," she added. Given all the attention that space debris of our own making receives, Close flags the fact that meteoroids are also a dangerous cosmic commodity. In addition, the Landsat 5 satellite lost gyro stability during the peak of the Perseid shower in 2009, similar to the Olympus failure and suggestive of a meteoroid-induced electrical effect. Numerous other satellite anomalies have been loosely associated with hypervelocity impacts, but no definitive cause has been established, Close said. "Human-made debris is something that we've caused and we’re responsible for," Close said. "If it hasn’t decayed, it’s in orbit and it’s a threat that we can track and hopefully mitigate. It’s our duty to make sure that it does not hurt or damage anything because we put it there." Meteoroids, on the other hand, are naturally occurring and can't be tracked per se. Meteoroids not found in streams are termed sporadic meteors. "If we see a meteor or a shooting star, it's already burned up and won't be coming back to threaten us. Of course, we monitor the parent comet or asteroid that created the shower, but we can't remove the parent comet or asteroid … nor should we," Close said. There’s also a general belief that meteoroids do little or no damage to satellites, Close noted, yet meteoroids have caused more anomalies than space debris on orbit. Specifically, the Olympus and Landsat 5 incidents and linkage to the electrical phenomenon that Close and her team are chasing. "We don’t know all of the details yet, but a story is starting to emerge that very fast particles, even if they are smaller than a microgram, can cause huge issues for satellites,” Close said. In regards to the upcoming Draconids, how much of a fear factor should they hold for satellite operators? Will they pack a punch? 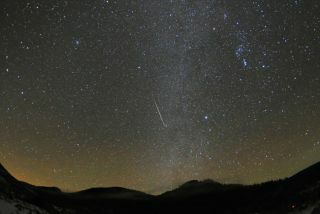 “The Draconids move slowly,” said William Cooke of the Meteoroid Environment Office at NASA’s Marshall Space Flight Center in Huntsville, Ala. Their speed is roughly 12 miles (20 kilometers) per second, "which is the same speed as the sporadic background, so the chances of an electrical upset are almost nil," he told SPACE.com. "The rates in the past, especially in 1985, were certainly high enough, but there was nada," Cooke said. "So the main concern with the ‘Dracs’ is impact damage or attitude displacements." Still to be studied, however, is just how fast a meteoroid needs to be moving to be trouble for a satellite controller. "I would say that there are many unexplained anomalies on orbit that are loosely associated with plasma or electrostatic discharges that may be caused by meteoroid impacts," Close said. Close was a member of a 13-person blue-ribbon group that recently produced the report, "Limiting Future Collision Risk to Spacecraft: An Assessment of NASA’s Meteoroid and Orbital Debris Programs." She and Peter Brown, a professor of astronomy at the University of Western Ontario, wrote the section on meteoroids. The full committee report recommended that a baseline effort should be established to evaluate the NASA Meteoroid Environment Model and flush out major uncertainties. "I think we should pay more attention to this issue," said Diego Janches of the Space Weather Lab at NASA’s Goddard Space Flight Center in Greenbelt, Md. He said research indicates this can be a serious issue — at least as serious as mechanical damage caused by impacts. Stanford University’s proposed MEDUSSA (Meteoroid, Energetics, and Debris Understanding for Space Situational Awareness) CubeSat. It would delve into spacecraft-damaging strikes by meteoroids. While ground-based research is under way, the Stanford group is also looking at a space-based research tool. The Meteoroid, Energetics and Debris Understanding for Space Situational Awareness satellite is long-hand for MEDUSSA. This diminutive CubeSat would dig into the issue about probable loss of spacecraft due to electrical damage from meteoroids. Once in Earth orbit, MEDUSSA would deploy a meteor screen that should see nearly one impact event per hour. Impacts on the meteor screen will be detected and localized using an optical camera. The CubeSat is also geared to characterize the effects of impacts from meteoroids and from energetic particles. MEDUSSA is not yet funded, but the Stanford group is working with agencies to move the project forward, Close said.